By Jim Dower: Interim WBA heavyweight champion Luis “The Real King Kong” Ortiz (24-0, 21 KOs) weighed in today for his fight on Saturday night against former two-time world title challenger Tony “The Tiger” Thompson (40-6, 27 KOs) for their fight on HBO World Championship Boxing from the DC Armory in Washington, DC. The 36-year-old Ortiz weighed in at 242.6lbs and looked in great shape. This is the normal; weight that the southpaw Ortiz comes in at. 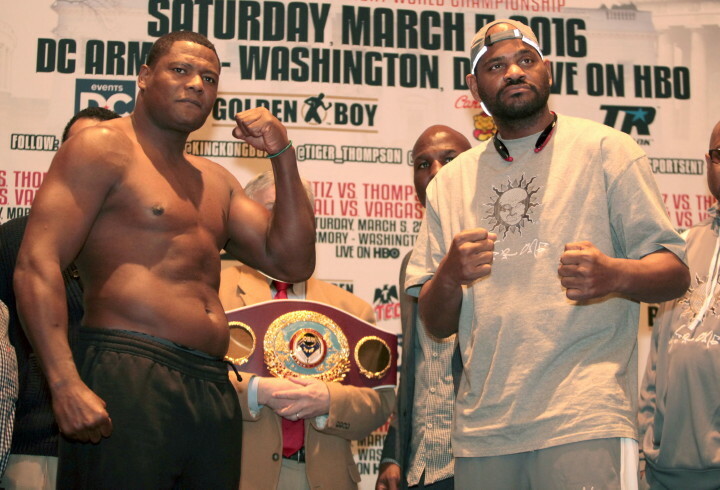 His opponent, the 44-year-old Thompson, weighed in at 263.8lbs. This is the same weight that Thompson weighed in for his last fight against Malik Scott last October. Thompson lost that fight by a 10 round decision and looked poor. Hopefully for Thompson’s sake it doesn’t mean he’s going to put in another bad performance. If he fights like he did against Mailk Scott on Saturday night, then Ortiz is going to have an easy time winning. The Ortiz-Thompson fight card will start on HBO at 10 pm ET/PT. Ortiz needs to keep looking good so that he can win more boxing fans, and so that he can lure the other top fighters to face him. Ortiz probably won’t be able to get any of the big names in the heavyweight division to face him until he wins the WBA “regular” title outright by beating the winner of the Ruslan Chagaev vs. Lucas “Big Daddy” Browne fight this Saturday night in Grozny, Russia. Ortiz needs to win the full WBA titl;e for him to be of any interest to the other champions and top caliber contenders in the division. That may never happen, but Ortiz has got to at least do his part by winning the WBA title so that he can try and get the bigger names to fight him. At 36, Ortiz is getting a late start. Even if he does win the WBA title this year, he probably doesn’t have much time before he ages out and loses his title unless he ages like Bernard Hopkins. In the co-feature, former WBA light welterweight champion Jessie Vargas (26-1, 9 KOs) weighed in at 146.2lbs for his fight against #1 WBO Sadam Ali (22-0, 13 KOs). The two of them will be fighting for the vacant WBO welterweight title. Ali weighed in right at the welterweight limit at 147lbs. Vargas, 26, is getting another chance to win the WBO title after losing to Tim Bradley last year by a 12 round decision in a failed attempt to win the belt. It’ll be interesting to see if Vargas gets another crack at the WBO title this year if he loses on Saturday. Vargas is promoted by Top Rank. Ali doesn’t have any big names on his resume, but he does have Olympic experience. He’s a talented fighter with decent punching power. He’s not someone that is going to dazzle you with his hand speed, but he’s got enough speed and boxing ability to give a fighter like Vargas a lot of problems. Vargas lost his WBA light welterweight title when he stepped up last year to challenge Bradley for his WBO welterweight title.